AVID Roots here presents four classic Big Bill Broonzy albums plus, including original LP liner notes on a finely re-mastered and low priced double CD. 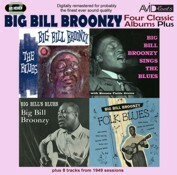 Big Bills Blues, Big Bill Broonzy Sings the Blues, Folk Blues and The Blues. A special note about this collection is that Big Bill Blues and Sings the Blues appear on CD for the first time!! Born in Mississippi in 1893 Big Bill Broonzy was one of the last of the great blues singers still alive and singing in the late 1950s and 1960s. Most of the greats had passed on or disappeared into obscurity after early recording careers has faltered way back in the 1920s and 1930s. In Big Bills own words Leroy Carr, hes gone, Big Maceo, hes gone, Jim Johnson, Ol Lead, theyre gone. If I dont sing the blues, who will? Maybe the blues will die someday. But Ill have to die first. Across these four classic albums you will hear why Big Bill Broonzy was considered to be one of the greatest blues singers of all time. Singing a cross section of his own songs and that of such legends as Leroy Carr, Bessie Smith, Gus Cannon and Richard Jones, Bill performs each in his own inimitable way with is own style of singing and his own unique brand of guitar playing! All four albums plus, have been digitally re-mastered for probably the finest sound quality ever!